Dr. Ramen Goel is one of the best bariatric surgeon in Mumbai. Dr. Ramen Goel is an advanced laparoscopic surgeon since 1992, who has been working as a Bariatric Surgeon as well, since the year 2000. After acquiring general education in India, Dr Ramen Goel has completed courses and trainig in bariatric and gastrointestinal surgeries in various cities across the globe. Dr Ramen Goel is also the co-chief editor for the Journal of Obesity & Metabolic Research (JOMR) and a reviewer for the International Journal of Obesity (IJO). 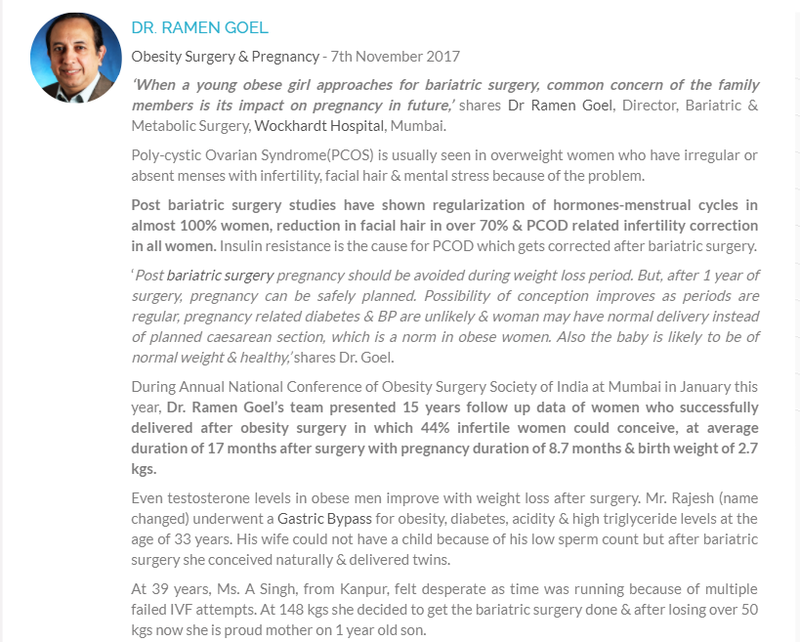 Dr Ramen Goel is one the top bariatric and obesity surgeon in Mumbai. Dr Ramen Goel experience includes the following: Ex. Hon. Laparoscopy & Bariatric Surgeon at Bombay Hospital & Medical Research Center and Fortis Hospital, Mulund, Mumbai. Dr Ramen Goel is currently Hon. Laparoscopy & Bariatric Surgeon at Apollo Spectra Hospitals, Mumbai, Hinduja Healthcare Surgicals, Mumbai and Breach Candy Hospital, Mumbai. 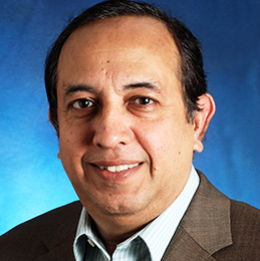 Dr Ramen Goel is also Co-chief editor for the Journal of Obesity & Metabolic Research (JOMR) and a reviewer for the International Journal of Obesity (IJO). Dr Ramen Goel has also been an Ex. Hon. Associate Professor of Surgery at Grant Medical College and JJ Group of Hospital, Mumbai. Dr Ramen Goel has also written various PG thesis co-guide for various institutions. 1st Bariatric surgeon from Asia accredited with Bariatric & Metabolic Surgeon of Excellence by Surgical Review Corporation, USA. Performed India's first gastric band, first banded gastric bypass and first mini lap bariatric surgery. Bariatric surgery derives its origin from baros which stands for fat. Though initially started as a weight loss intervention, it is increasingly recognized as a therapeutic measure to treat various chronic diseases. Over 200 comorbidities as associated with obesity and bariatric surgery as accepted not only therapeutic but even has preventive to disrupt disease cycle or progressive to illness. Type-2 Diabetes control in 80% to 100% patients. Obstructive Sleep Apnoea remission in over 90% patients. PCOD remission in over 70% patients. Musculoskeletal pains especially in knee joint pain and backaches. Psychological improvement from depression, low self-esteem, etc. Reduced urinary frequency related to visceral fat. Enhanced education prospects, employability and responsibility assignments. In pre - diabetic beta cell damage and diabetes can be prevented. Possibility of PCOD related infertility is reduced. Reduction in enhanced incidence of hypertension. Reduced incidence of obesity related cancers. 30% reduction in first time cardio - vascular incidents. 50% reduction in cardio - vascular related mortality. Bariatric surgery has been a life changing experience for most of our patients. It has never been a cosmetic issue and with revised international guidelines,surgery can be offered to lower BMI in patients due to recognition of stand-alone diseases benefit. 27.5 BMI in uncontrolled type 2 diabetics. >37.5 BMI even in absence of any co-morbidities. Lap band surgery: Also known as laparoscopic adjustable gastric banding (LAGB), is a form of bariatric surgery or restrictive weight loss procedure. It is used as a treatment for obesity. This procedure reduces the amount of food one can consume, by reducing the size of the stomach, and thereby also reduces the amount of calories the person can consume, thus aiding weight loss. It is the second most frequently performed bariatric surgery after gastric bypass surgery. Gastric bypass surgery: Gastric bypass surgery is performed for the purpose of weight loss as it shrinks the pathway for absorption of food due to by-passing a part of the digestive system. Gastric bypass surgery has proved to be extremely beneficial in reducing weight. Up to 70 % of the excess body weight will be lost after this form of bariatric surgery. The patient will not be able to eat large portions or quantities of food like before and will absorb fewer calories from food. This surgery will also result in higher metabolism due to hormonal changes. Problems such as high blood pressure, cholesterol and diabetes will also decrease significantly after the surgery. Sleeve gastrectomy: Also known as gastric sleeve, is a form of bariatric surgery or weight loss procedure. It is used as a treatment for obesity. This procedure involves removing a large portion of the stomach surgically, making it much smaller, thus aiding weight loss. It is a less invasive surgery as compared to gastric bypass and is usually performed in patients for whom a gastric bypass is not a plausible option.